Last year I reviewed free samples from Salcura - review link. If you are not familiar with the brand they offer natural products for skin problems such as eczema, acne and psoriasis. I thought I would re-visit the brand and explain why I like it. 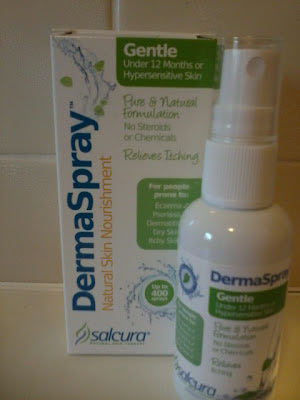 Out of the samples it was the Gentle DermaSpray that impressed me the most and I have re-purchase the full size twice. I prefer the Gentle spray over the Intensive because the fragrance is easier on my nose. I found the Intensive version overpowering and not to my liking. Salcura does not make my eczema disappear but it helps me to manage my symptoms. I find it relieves itching almost instantly and keeps it at bay for several hours. The spray is ideal for the summer as it is refreshing especially if chilled in the fridge. Treating eczema with a product in a spray form is ideal if touching your skin causes pain or possible infection. A little while ago I was having a terrible time with an eczema patch on my chest. DermaSpray got me through the worst stages when other products were not working for me. Currently I am using the product less frequently but would not be without it in my cupboard. I have recommended Salcura to a couple of people including Nadia from Eczema Skin Remedies. Nadia tweeted that she had been using the Salcura Zeoderm Skin Repair Moisturiser but had notice it contained Urea. This is an ingredient I had not spotted when I originally discovered these products. Urea is commonly used in eczema skin care but I choose to avoid it. For those of you who do not know Urea is a chemical compound found in urine, although it is also made artificially. The synthetic version of the compound is created from ammonia and carbon dioxide and can be produced as a liquid or a solid. I do not know what type of Urea is in Salcura. I think Salcura looks great ...have you heard much about their antiac spray? I know it won some kind of reward on embarrassing bodies?? I do make reference to their other products in this post. The antiac is for acne that's not a condition I suffer from, this post is about my eczema.